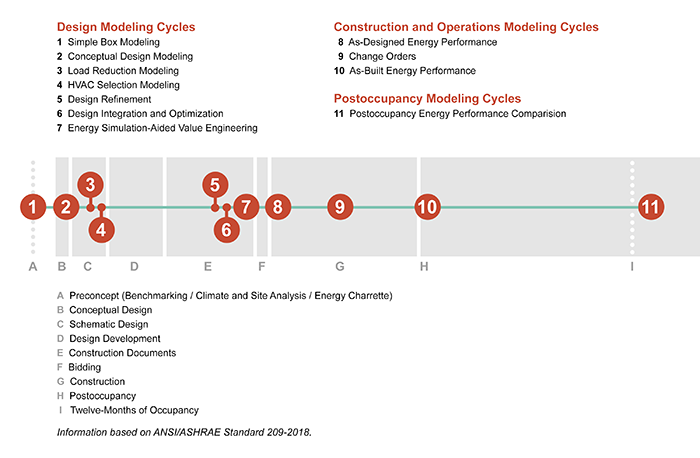 ASHRAE advances this notion by identifying eleven distinct "modeling cycles," which occur at specific points in the development of a building project (see Figure 1). Each modeling cycle is characterized by a specific purpose, applicability, and type of analysis. Project teams are not necessarily required to execute all eleven modeling cycles but as a collective, the modeling cycles clarify the definition of the building energy modeling exercises critical to each stage of a project's design/construction/occupancy. Figure 1: ASHRAE Standard 209-2018 Building Energy Simulation Modeling Cycles by Project Phase. Figure courtesy of Daniel Overbey.